Blake Schlabach joined the Indianapolis Symphony Orchestra in 1982. Born in Royal Oak, Michigan, he grew up in the Cleveland area and received his B.M. degree from DePauw University where he studied with the Orchestra’s principal trombone, James Beckel. He has also studied with Lewis Van Haney and Martin Fako. Participation in five summer programs at the National Music Camp at Interlochen helped direct his career. Schlabach is orchestra personnel manager of the ISO after serving as the assistant for 10 years. 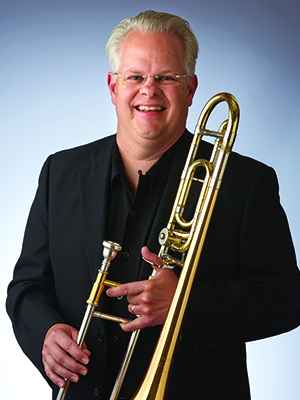 He teaches privately, plays in Chamber Brass Choir and the Indianapolis Trombone Quartet, and leads Equinox, a jazz quintet featuring trombone and tenor sax. He is a respected recording studio artist and has served as section coach for the ISO’s Side by Side program. He and his wife, an educator/administrator, are the parents of a son and a daughter. In his spare time, Schlabach enjoys all things automotive. "Whenever I'm asked about my favorite composer or work, my response is always...'whatever we are playing this week!'"